Sometimes all these different cash savings/rebates websites overwhelm me, and although I would like to. Where would you recommend that I start in order to get the most bang for my buck on gift cards? I agree figuring out how to use all the different point programs out there can be overwhelming, and I certainly did not start out using 18+ different programs. I started out with just one. 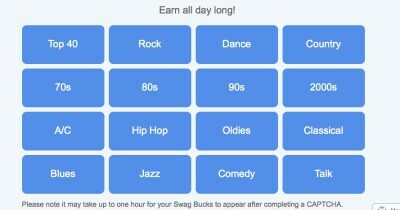 If I had to pick a one stop best bang for time spent point rewards company now I would pick Swagbucks. Swagbucks offers so many ways to earn that no matter what you are doing online it just might be possible to earn some Swagbucks while doing it. This is what the Swagbucks homepage looks like. I make it my homepage so I always remember to enter my searches through it to earn points. Download the Swagbucks toolbar or make their homepage your homepage, or both so that you enter all your daily web searches through Swagbucks and have the chance to earn Swagbucks each and every time you do. I recently read on the Swagbucks website that members on average earn 10 points a day doing this which works out to 300 points a month just with this one point earning action. Considering a $5 gift card is just 500 Swag Bucks this action alone puts you well over 1/2 way to earning a gift card each month and you will earn it doing something you have to do anyways. Make sure to check and see if Swagbucks offers points per dollar spent. 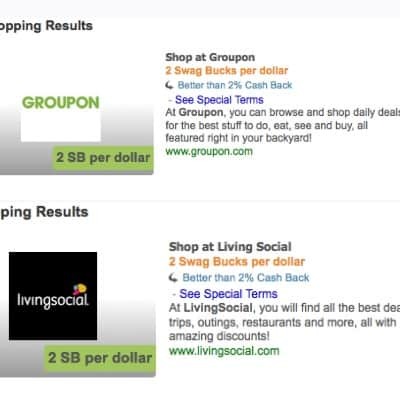 You can do this by clicking the shop tab at the top of the Swagbucks home page, or you can simply enter the store that you want to shop into the Swagbucks toolbar and if the store you want to shop at offers a cash back through Swagbucks you will get a screen that looks like this…. Just click on this information and it will take you to the store and track your purchase for cash back in Swag Bucks. Once you click on the square with the qualifying store on it a screen will pop up that says “Congratulations……you are on your way to earning….. Swag Bucks per dollar at……..”. 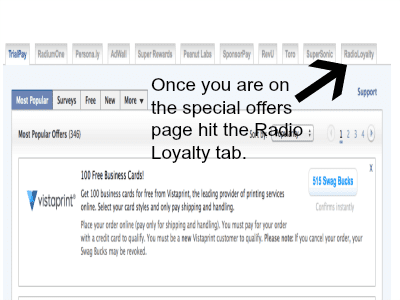 Use the Radio Loyality program available through Swagbucks. For every 30 minutes of listening you are rewarded with a CHAPTCHA code that when you enter it will give you 5 Swag Bucks. Radio Loyalty is a bit hard to find basically hit the Special Offers tab found under the Discover tab on the Swagbucks homepage. When you do you will see a page that looks like image above the Radio Loyalty tab is at the end. There are plenty of station choices for everyone. My favorite station is the Classical one, I often turn it on and put my headphones in while I write so that I am not disturbed by sounds around me. I set my cell phone for 30 minutes so that I remember to look for my CAPTCHA code to enter when it pops up. Points are not added instantly and can take up to 1 hour to appear. If you like playing online games…. You can get 10 points a day playing games. You get 2 points for every other game you play for free (I’ve never done the tournaments). Swag Jump and Swagasaurus Run can be played in a matter of seconds. My kids like to play them, so a lot of days I have them do the games for me. That mean you earn up to 300 Swagbucks a month just by playing games. My favorite Swagbucks TV channels are the Home & Garden and the Health. When my kids were smaller they really likes watching the Animal channel. Check out Swagbucks TV on your laptop or desktop computer. You earn 3 Swag Bucks for ever 10 video clips watched up to 150 Swag Bucks per day. You can also leave them open in another tab of your laptop as you work in another tab and earn points as you work. 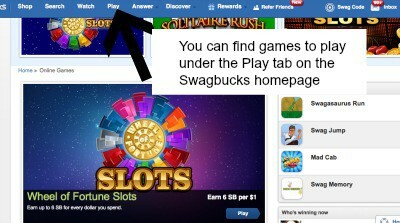 If you have a smartphone or a tablet check out the 5 video watching apps that Swagbucks offers to earn Swag Bucks in. If you are a video watcher these options can keep you in videos all day long. Of course you can also get the app running and let it earn points for you as you do other things. Check out the Swagbucks coupon area and earn points when you redeem them. You will receive 10 Swag Bucks for every coupon you redeem. Please not it takes a while for coupon points to show up in fact it could take up to 12 weeks. Once you are hooked you are going to want to tell your friends and Swagbucks rewards you for that too. You get 10% of what your Friend earns through Swagbucks (for certain point actions only) for life. 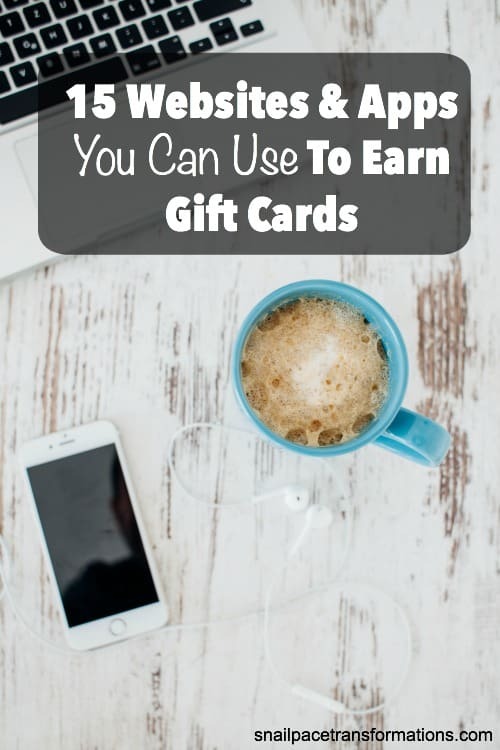 If you want to spend just a bit more time online earning more gift cards…. Truly Swagbucks is so flexible any person who uses a computer can use it and earn at least one $5 gift card each month and many will easily earn enough for the one reduced point 2200 Swag Bucks $25 gift card per month each member is allowed, without taking any extra time out of their day to do extra point earning actions over at Swagbucks. However you could earn much more than $5 to $25 in gift cards; I have readers reporting earnings of $100 a month. So if you too are overwhelmed by all the point programs out there and it is stopping you from even trying, I suggest you first start with Swagbucks. I truly believe it to be one of the best one stop rewards program out there. Thanks so much for this! I have been so overwhelmed with coupling and all the point systems in the past that I stopped fooling with any of it and just started going to Aldi only, but some changes to my finances are going to force me to start saving and planning even more carefully than I already have been and I’ve been overwhelmed with the thought of jumping back in. But it sounds like swag bucks would be a good place to jump back in! Yes Swagbucks is a great program for those who are overwhelmed at the thought of doing several at once. 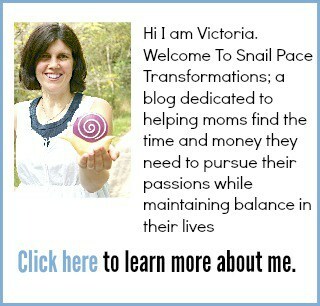 There are so many different ways to earn. 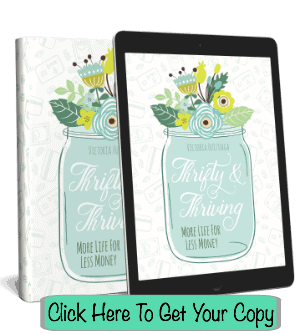 I say set a goal and go over what Swag Buck earning activities you need to do each day to make it happen. Perhaps the first month just aim to earn the 2200 $25 gift card and then build from there. I am now earning $100 a month from Swagbucks, took me a while to figure out how to do that but it just was a learning curve. Very cool. I had never heard of this until your post. Thanks for sharing!